The party is over for Johnny Manziel as the Cleveland Browns officially waived the struggling quarterback today. This move was a long time coming as it was reported that the Browns would wait to cut Manziel until the new league year opened this week to save salary cap space. New Browns coach, Hue Jackson, stated from the beginning that Manziel’s kind of behavior would not be tolerated and he has stuck to his word. Cleveland took a gamble in the 2014 NFL draft by selecting the 2012 Heisman Trophy winner with the 22nd overall pick. It appeared that the Browns finally had their man at QB, but a career that had such promise was quickly filled with turmoil. During the 2014 draft, Manziel texted Browns officials to draft him so they could “wreck this league together.” Browns fans felt like they finally had a quarterback that was ready to buy in to what the team was doing. Manziel may have said that he was ready to make an impact in Cleveland, but his focus was clearly elsewhere during the summer before his rookie season. In the months following the draft, he partied the summer away in Las Vegas and Texas. The troubles continued for Manziel at training camp when he showed up late for a meeting because he “misread the schedule.” Johnny finally had the chance to prove himself on the field on December 1, 2014 against the Buffalo Bills. Manziel replaced Brian Hoyer and ran for a touchdown on his first drive. He would start his first game two weeks later, but it was hardly memorable. Johnny threw for 80 yards in a 30-0 loss to the Cincinnati Bengals. Former Browns quarterback Johnny Manziel scrambles against the Washington Redskins on August 13, 2015. After a tough rookie season, it seemed like Manziel was finally on the right path when he entered a rehab facility on January 28, 2015. It was a decision that showed a lot of maturity from the former Heisman winner in the hope that it would carry over to a successful second season. Josh McCown won the starting role, but Johnny wouldn’t have to wait long for his chance to take the field. 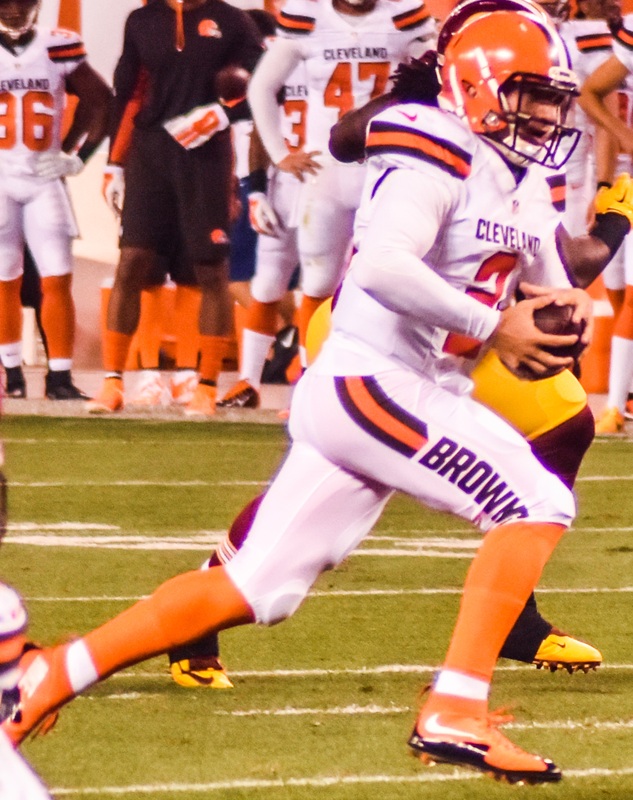 Manziel replaced McCown in the 2015 season opener against the New York Jets, throwing a long touchdown pass to Travis Benjamin. He would get another crack at starting in Week 2 against the Tennessee Titans. Johnny had a strong showing throwing two deep strikes to Benjamin in his first win as a starter. McCown returned to the lineup the following week, just as Johnny was starting to show some promise. Head coach, Mike Pettine named Manziel the starter for the remainder of the season on November 17. The following week, a video appeared online of Johnny dancing in a Texas club while holding a bottle of champagne. The video was filmed during the Browns bye week and it was revealed that Johnny lied to Pettine about when the video was taken. Two weeks later McCown suffered another injury and Johnny started the next three games. On December 31, the Browns ruled out Manziel for the season finale against the Pittsburgh Steelers due to a concussion. He then failed to show up to the Browns practice facility in Berea on game day to undergo concussion protocol. 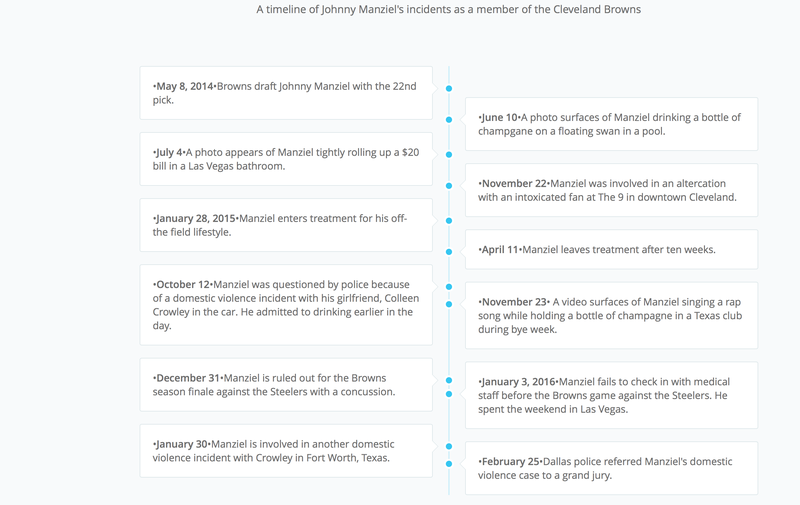 This is where the Johnny Manziel saga reaches it’s most bizarre point. Manziel missed the season finale because he spent the weekend in Las Vegas in disguise as a man named “Billy” with a blonde wig and mustache. To leave your team during a game week to party in Las Vegas is not only unprofessional, but it is unacceptable. Johnny Manziel’s time in Cleveland has come to an end. The Browns gave the young quarterback countless opportunities to fix his off the field issues and to focus on football. Instead, Manziel’s problems were more serious then they seemed and when it came down to it he had no interest in continuing his career in Cleveland. Johnny’s story took a dark turn last month when he was investigated by Dallas police for a domestic violence incident involving his ex-girlfriend Colleen Crowley. Manziel reportedly threatened to kill both himself and Crowley. On February 28, Dallas police referred the case to a grand jury. He could face up to one year in jail and a $4,000 fine. 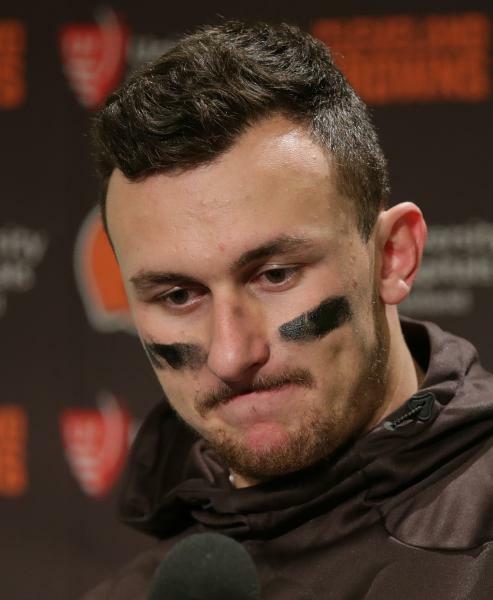 So the question arises..what is next for Johnny Manziel? Manziel’s NFL future is now more unclear than ever with his ongoing investigation. If he ends up in jail for a year, I think it will be very difficult for him to get another chance in the NFL. However, if Johnny does not go to jail two teams come to mind that could make a move to sign him. The first is the Los Angeles Rams who already have a quarterback question with Nick Foles and Case Keenum. I think the idea of Manziel playing in the City of Angels could be a recipe for disaster with many temptations for his off the field lifestyle. The team that makes the most sense to me is the Dallas Cowboys. Dallas is an obvious choice not only because it is close to Manziel’s home, but Cowboys owner, Jerry Jones may be the man that can help Johnny. Jones has had success with giving second chances to troubled played such as Dez Bryant and Greg Hardy. Jones coveted Manziel in the 2014 draft and he has the resources to help him. It is not too late for Johnny to get help and one can only hope that he takes the necessary steps to get his life back on track.